Its sad and pathetic at the same time. 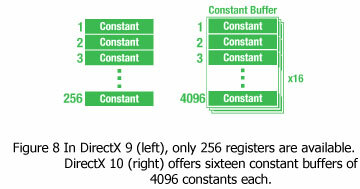 DirectX 10.0 should be a "transitional" solution...That is, it covers both XP and Vista. This allows people to gradually upgrade their hardware, and if they wish, to Vista. What MS is doing now, is throwing everyone (developers and consumers) into the deep end, and expecting them to pay for the changes. (I suspect some would be put off by this, while the majority will continue to accept it...Which is unfortunate). Great article BTW. Interesting to see the high-end stuff...But I doubt I can afford it in this lifetime! (1) Any chance of looking at a triple video card setup? (I saw a presentation slide which had 2 video cards in SLI, while a third showed something else on screen). (2) Any idea when the GF8600-series comes? Great, links arent working ? When you break all hardware/software ties to something that has been around for 4-5 years? Its not that easy making it "transitional". From a software perspective, D3D10 is not compatable with XP in the least. Due to the size of this article and the amount of time it took to get ready, let me preempt any comments about the spelling and grammar. I am in the process of editing the final document as I read through it, and there are spelling/grammar errors. If they bother you too much, check back in an hour. If you read this an hour from now and you still find errors, then you can respond, though it would be useful to keep all responses in a single thread like this one. "If DirectX 10 sounds like a great boon to software developers, the fact that DX10 will only be supported in Windows XP is certain to curb enthusiasm. " I believe this should say "DX10 will only be supported in Windows Vista..."